This recipe finds its origins in another recipe from Deborah Madison. As some of you know, when I was a vegetarian, I cooked my way through her Vegetarian Cooking for Everyone. I learned so much from that book: how to prep, how to cook vegetables (trickier, I think, than meat), how to not be afraid of trying things I had never eaten before (cardoons? sorrel anyone? ), and how to improvise (the most important lesson of all). In 2001, the Times released a collection of recipes gathered from its most popular chef contributors, including Madison. The Chefs of the Times is a great cookbook to have, not just because the dishes are all terrific, but because each one is prefaced by a short introduction in which the chefs talk about how they got to the final versions of the recipes found in the book, from inspiration to execution. It was here that I found Madison’s interpretation of the traditional Tuscan torta d’erbe. A torta d’erbe is, in essence, a very rustic dish normally comprising of whatever greens or vegetables you have one hand, bound together with beaten eggs, ricotta, and/or parmesan, and baked in a pastry crust. Madison does a different take on the traditional pastry by cutting the amount of fat in the dough, and using yeast to lighten it and make it flaky. In the published recipe, she had you make a covered pie in a tart tin. However, when I started making it, I would just divide the dough in two and make a great big free-form tart. Now I go one step further and made individual hand pies. I also use just olive oil for the crust (instead of butter, or a mixture of butter and olive oil), and do a mix of whole wheat and all-purpose flour. These hand pies are the year’s real first stab at something a little healthier to eat. They are full of good things that are good for you. To turn the recipe back into a vegetarian one, simply omit the ground beef, and double the amount of ricotta. In either case, if you would like to make the pies a little richer, you can add about 3 ounces of grated parmesan, or crumbled feta cheese to the filling. 1. In a small bowl, combine the yeast with the warm milk and the sugar. 2. In a large bowl, mix the 2 flours together with a hefty pinch of salt. Make a well in the center of the flour for the olive oil and just one of the eggs. Using your hands, combine the flour with the oil and the egg until the mixture is nice and crumbly. Add the yeast-milk mixture all at once, and knead the dough together by hand until it is relatively smooth. Place the dough in a lightly oiled bowl. Cover it with plastic wrap, and let the dough rise in a warm, dark place for about an hour. 3. In the meantime, sauté the onion in a large skillet with a little bit of olive oil over medium-high heat until it is no longer opaque. Once the onion begins to turn golden, crumble the ground beef into the skillet. Cook the meat until it is no longer pink. When the ground beef begins to brown, add the herbs to it. Continue to cook everything until most of the water has evaporated. The herbs should be softened, but still bright. Using a slotted spoon, transfer the meat mixture to large bowl, leaving behind as much liquid as possible. If there seems to be a lot of liquid, drain the beef mixture as best as you can. Adjust the seasoning. 4. To the same skillet, add the spinach. Cook it over medium heat until it wilts. Remove it to a colander. Repeat the process with the chard. When the spinach and the chard are cool enough to handle, use your hands to press as much liquid as possible out of the leaves to remove the moisture. 5. Combine the meat and herb mixture, the wilted greens, the lemon zest, the ricotta and one egg. Adjust the seasoning, and divide the mixture into 8 equal parts. 6. Preheat the oven to 375°. 7. When the dough is ready, divide it into 8 equal parts. Roll each part into a ball. Flatten out each ball of dough with your hands before rolling it out into a round about to an 1/8th of an inch thick, and about 6 to 7 inches in diameter. You can do this on a lightly floured surface if needed, but because of the olive oil, the dough shouldn’t be very sticky. Mound a portion of filling in the center of the dough. Fold the dough over the filling, making a half-moon shape. Lightly press the air out of the filling as you seal the pie around its edges. Trim the pie so that there is about a half-inch border all the way around. Use the tines of a fork to make impressions around the pie. Cut three even slits into the top. Repeat these steps for the remaining 7 pies. 8. Evenly position the hand pies on a large baking sheet lined with parchment paper. You may need more than one baking sheet. Beat the last remaining egg. Using a pastry brush, gently brush each pie with the beaten egg. Bake the pies for about 35 minutes. I used to volunteer as an ESL teacher to Bosnian refugees. They made pies very similar to this. The pies were amazing! The Bosnians would also buy super cheap coffee at the grocery store, bring it home, roast it in the oven, and make the most incredible coffee ever….like Starbucks quality stuff. Omg. I love that story! First of all, that must have been an amazing experience. Secondly, those pies must have been sooooo good. And the coffee! That is so cool. Have you done it? I need to try that! Immigrant communities come up with the best stuff. Your pies turned out beautifully! I am so impressed that you cooked your way through Deborah Madison’s book. I love the book but many of the recipes are complex (at least for me after a long day of work when I’m facing hungry kids). Definitely a weekend sort of thing though! Thanks! It took me about a year! I think, though, once you start going, it becomes like the endless supper, like the leftovers from one dish become the start of a new one. But its true that when you are coming home after a long day, the last thing anyone wants to do is prep a bunch of difficult to wash/peel/cut vegetables. Thank goodness for the weekends! Ooooh! Jamaican beef patties! Another food for the list of things to make in 2012! Thanks for the idea! 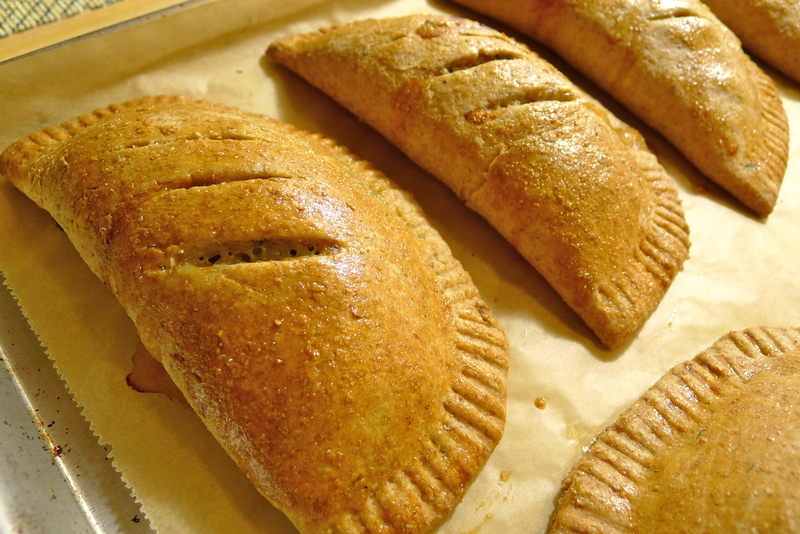 These look great – pastry looks light – I tried pasties once but the pastry ended up like concrete! Thanks! Yeah, pastry can sometimes be a cruel mistress. I should try my hand on some Cornish pasties. I learned once that old coalminers use to eat the pie, and chuck the thick, bready edge they were holding onto. That way they wouldn’t ingest any nasty stuff from the mines that might have been on their hands. When my pastry turns out a little doughy, I think about that. I love that recipe (& cookbook)! I have made it several times but next time I will try them as individual servings like this–the baking time must be faster which should help the crust stay nice and crisp! Sometimes I have found it a bit soggy–it’s hard to cook all those greens completely dry. Thanks for the idea! Thanks for the comment! Yes, it’s not easy to keep the filling dry and moist at the same time. Madison says you shouldn’t squeeze the liquid out of the leaves, but I will own up to it and say that sometimes I have! This looks very yummy! I’m reminded of the Philippine empanadas which is similar. I’ll definitely try this. Philippine empanadas? That sounds yummy! I’m going to google it!